A system of belief or religious practice based on supposed communication with the spirits of the dead, especially through mediums. Spiritualists believe that souls who believe in spiritualism have to go through a certain set of processes after death, this then leads to a state of spiritual perfection, to be let into the next stage of their life to come. Harry Houdini's story - In the 1920's, when harry's mother dies, his supernatural side kicked in when he tried to contact his dead mother. So, then after he died, his wife tried to contact him and she continued to hold seances (meetings to attempt to contact the dead.) One time when Mrs Houdini tried to contact Harry nothing happened for the first half an hour or so, she then decided to turn out the light. All of a sudden, a violent storm broke out with Thunder + lightning drenching everyone involved. Later on, Mrs Houndini found out that the storm didn't occur anywhere else in the area. .
Every night around bedtime the girls heard a series of knocks on their bedroom walls. Their neighbour came to see what was happening one day. She said " count fifteen,," the room shook of 15 thuds. The neighbour then said in you're an injured spirit, knock 3 times, and it did. They thought it could have been a prank, but then found out Issac and Amy Post thought the spirit belonged to a peddler who had been murdered 5 years beforehand. they then discovered heir and bone fragments on the floor. Issac heard faint thuds under the floor at another place. More convinced, when Leah Fox also be communicating with the Posts' recently deceased daughter. One day, in a private chamber they were accompanied by sceptics who found no evidence of a hoax. Spiritualists didn't have a calendar as such, but they did have some history about the religion. 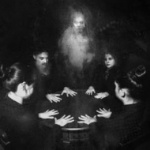 Spiritualism started when movement began on march 31st 1848 when Kate + Margaretta Fox first communicated with a spirit of a deceased peddler in their home in Hydesville, New York. Later on, some people attempted to contact the dead again to recapture the public's fascination. That's when spiritualism became a form of alternative religion. Marilyn Awtry is known as Spiritualism's walking encyclopedia of the 21st century. Every Year she goes visits the CSE for a Seance held in honour of spiritualism's birthday. Harry Houdini + Margaret and Catherine Fox were people who started spirituality as a religion, they had experienced spirits trying to contact them. Even in one of those experiences, sceptics came to figure the problem out, they found no evidence that it was a hoax. Some reasons it was chosen: It is a bright + strong flower and the seeds are nourishing. But mainly because it turns towards the sun. 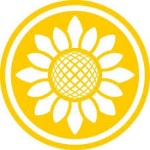 You will often find spiritualists have art, jewellery or other things with sunflower designs on them. Spiritualism doesn't have a sacred text, but instead they believe in the seven principles - a way that guides rather than preaches. Spiritualists believe after death the soul leaves the body and returns to the spiritual kingdom it came from at birth. This Kingdom exists of multiple ascending stages of purification. The purpose of each incarnate lifetime is to achieve a greater purity and rise to higher levels, the ultimate level is known as a union with God. At that point there’s no further need to return. Some people think that souls travel in families forever or for a certain amount of time and that strangers sometimes recognise each other instinctively in their current lives from some unremembered association in their earlier life.The issues in their past life sometimes have to do with their spiritual connection to each other. A man's rude father may return as an abused wife in their next life. This sometimes leaves a responsibility they will have to make balanced before they can move onto what ever mission is next.